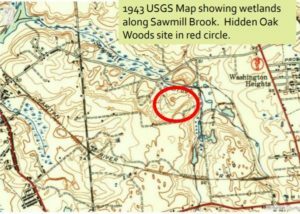 Along the Sawmill Brook corridor, part of the greater Lawrence Brook Watershed and Lower Raritan River basin, remains a unique geological remnant from the Wisconsin Ice Age of more than twelve thousand years ago – Hickory Swamp. This landform is the northern-most example of Pine Barrens in New Jersey. Although the area has remained undeveloped since the time of the Lenape, a major apartment development threatens the destruction of this habitat and poses irrevocable harm to the Sawmill Brook. 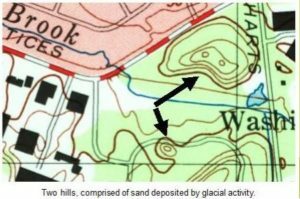 The Wisconsin Glacier ended at what is now the large hill just north of Exit 10 of the New Jersey Turnpike, about eight miles north of the proposed development site. At this point, the glacier was one-mile high, having descended from a height of 3 miles high further north. Beyond this massive glacier was a polar desert, with sand and loess being blown in by the wind from the north at a rate of 65 knots (75 miles) per hour. Wherever sand was deposited in enough quantity to create a habitat, sand barrens were formed. There are barrens at Albany and Long Island in New York, and the northern-most Pine Barrens in New Jersey is the wooded area along the portion of the Sawmill Brook, which runs through Harts Lane. Due to the environmental restrictions of the forty-five acre site proposed for development, there is a checker-board pattern of existing conservation areas. If the site is turned into a literal mini-city (net density of the developable land is over fourteen units per acre, with six hundred parking spaces), these scattered conservation areas will be further fragmented, and partially destroyed by construction activities. The fight to preserve this unique landform is spearheaded by the Preserve East Brunswick Pine Barrens Coalition. 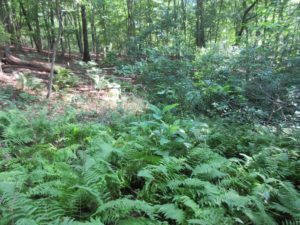 The Sierra Club and the Lower Raritan Watershed Partnership have provided letters of support for conservation of this site, and it is hoped that this forty-five acre tract will be preserved and added to three adjoining preserved open space parcels, all connected by the Sawmill Brook corridor. 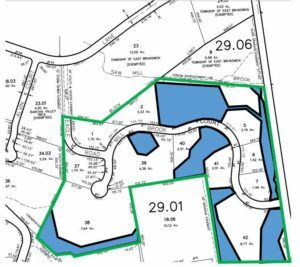 The Hidden Oak Woods development application is scheduled for a public hearing before the East Brunswick Planning Board for December 5, 2018 at 8 p.m. in the East Brunswick municipal courtroom. At that time, it is anticipated that the applicant will conclude its presentation and the Coalition will then present the counter case against the proposed mini-city. Interested persons and organizations are welcome to attend. For further information, please find the Preserve East Brunswick Pine Barrens Coalition on Facebook, or email richwalling@hotmail.com. Together, we can ensure that this vestige of our natural history will be preserved for future generations. Earlier this month I traveled to Salzburg, Austria to take part in the Salzburg Global Seminar Session “Building Healthy, Equitable Communities: The Role of Inclusive Urban Development and Investment.” I was invited to discuss the role of citizen science in watershed management and land use planning, and my presentation highlighted issues and opportunities in New Jersey’s Lower Raritan Watershed. More specifically, I linked the work of Lower Raritan Watershed Partnership volunteers who collect water quality data and map stormwater infrastructure with desired human and environmental health outcomes. How can we leverage trends and opportunities in urban revitalization with investments in infrastructure to focus on health, equity and the public good? Are there key policy strategies or practices that support healthier and more equitable housing, transportation, utilities and park/open space/environmental systems? How can we foster a shared sense of community in the built environment? Can that lead to infrastructure in the public interest? Can, and how can, data and citizen science be used to direct resources and promote equitable development? Seminar discussions were punctuated with case study presentations and problem solving “labs,” and we soon organized ourselves into working groups to develop theoretical statements, policy proposals, and frameworks for practice and action. I was part of two working groups. One of the working groups, which included individuals from Hong Kong, New Zealand, Australia, Spain, Canada and the United States, set out to address immediate community needs related to the fragmentation of habitat in our built environments. This group designed a tool to map and prioritize underutilized community infrastructure for public multi-sharing/multi-functional use. The Lower Raritan Watershed Partnership plans to pilot the tool in the Lower Raritan Watershed in coming months. The other working group, which in addition to myself included individuals from India and Germany, developed a research agenda to address a gap in the literature related to health outcome assessments at the watershed level. Both groups have been asked to develop an issue brief for publication in a special issue of the British Medical Journal. 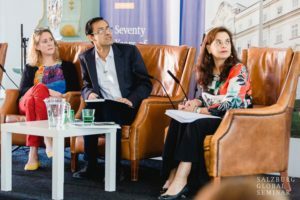 In addition to advancing research and action around healthy, equitable communities, Salzburg Global Seminars formed a global peer support network of Seminar Fellows – that is professional practitioners from around the world working in the built environment and health. The LRWP is pleased to be part of Jersey Water Works, a collaborative effort of many diverse organizations and individuals who embrace the common purpose of transforming New Jersey’s inadequate water infrastructure by investing in sustainable, cost-effective solutions that provide communities with clean water and waterways; healthier, safer neighborhoods; local jobs; flood and climate resilience; and economic growth. The LRWP is active on the Green Infrastructure subcommittee. Jersey Water Works recently published Our Water Transformed: An Action Agenda for New Jersey’s Water Infrastructure – check it out! And plan to join Jersey Water Works for their annual conference on December 7 at the New Jersey Performing Arts Center in Newark!